To make a long story short, I accepted a dare from a friend to eat all the zucchini that her plant could produce. (She doesn't like zucchini and said she'd go ahead and plant some in her garden just to taunt me with it.) Lo and behold, I arrived home one evening to find three very large zucchini on the doorstep (with more on the way). 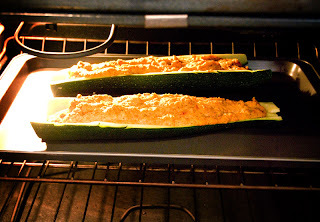 Accepting her challenge, and with my husbands kind indulgence, he allowed me to make an entire dinner out of zucchini. 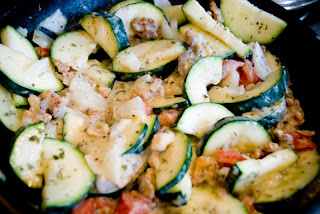 A simple dish which involved dumping one of the zucchinis, along with onions, tomatoes, flour and salt on the stove. And, of course, zucchini bread! Now the problem is that the plant is still producing and more is coming. Other than making loaves upon loaves of zucchini bread for every member of our church, I need some more ideas! Quick! 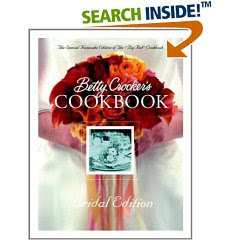 Got any good recipe suggestions!?! The goddess salad dressing would be yummy on it too! Shred it and put a cup each in little baggies and freeze it. Then you have some for zucchini muffins, bread, cake, whatever all winter long.